Democratic Sen. Kirsten Gillibrand (N.Y.) said Thursday that Bill Clinton should have resigned the presidency due to his extramarital relationship with White House intern Monica Lewinsky. When asked if Clinton should have resigned at the time, Gillibrand paused and told the New York Times, "Yes, I think that is the appropriate response." Gillibrand argued that attitudes toward sexual misconduct have changed since the 90s. Clinton had several sexual encounters with Lewinsky from 1995 to 1997. Their relationship came to light in 1998. 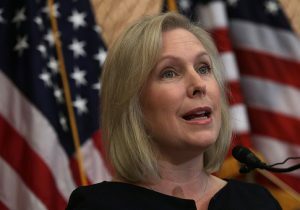 "Things have changed today, and I think under those circumstances there should be a very different reaction," Gillibrand said. "And I think in light of this conversation, we should have a very different conversation about President Trump, and a very different conversation about allegations against him," she added, referencing accusations of sexual misconduct against the current president. On the subject of the recent allegation by a woman that Sen. Al Franken (D., Minn.) groped and sexually assaulted her in 2006, Gillibrand said "it's very disturbing," and "I was very disappointed. But it's important that survivors are coming out and speaking truth to power and telling their stories." Gillibrand has long ties to the Clintons and backed Hillary Clinton's 2016 presidential campaign. "In my adult life, politically, no one has inspired me to get off the sidelines and truly make a difference more than Hillary Clinton has," Gillibrand said in an essay supporting her. Gillibrand sent a tweet in April 2016 of her and Bill Clinton campaigning together in New York.